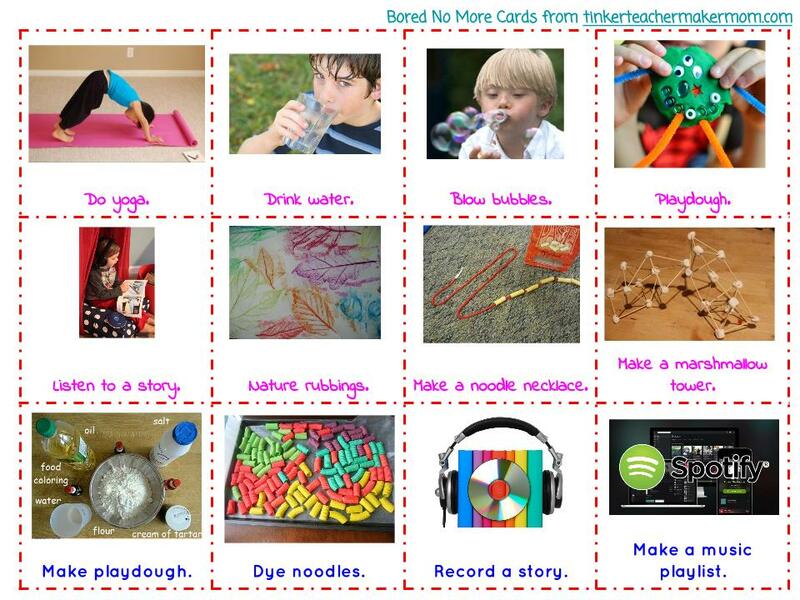 I have seen so many great lists of things to do when the kids are bored. But my kiddo is still an emerging reader and he relies heavily on “but I can’t REEEAAAADDD!” whenever he thinks it’s beneficial. So I made some Bored No More cards with pictures. Tomorrow, I’ll be printing them off, laminating them on index cards (I found some nice pre-cut half index cards the other day…) and putting them on a ring. I’ll post pictures of the finished product once it’s all cut out and complete. Turn on music and dance. Take pictures with your camera. Play a musical instrument. Don’t have any instruments for your kids to use? No worries! Make some together! Paint. No need to buy paint, check out these recipes for homemade! Build with Legos. Have 5,000,000,000 Legos like we do? 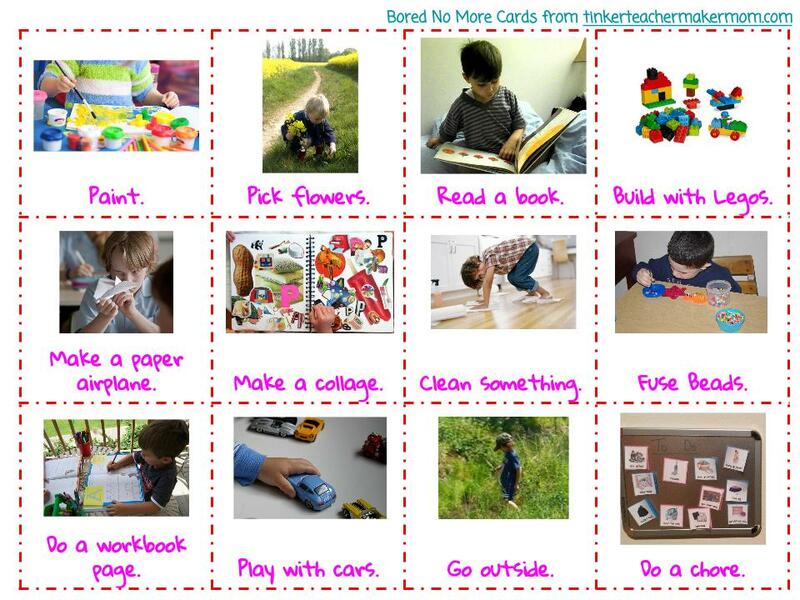 Try Lego Pattern Cards and Lego Challenge Cards! Do yoga. Check out the Cosmic Kids Yoga channel on YouTube or the Gaiam Kids Yoga DVDs. Drink water. Take a few minutes to relax, hydrate, and think of a plan. Blow bubbles. Find a bubble recipe that works for you! This is where it switches from mostly-independent activities to with-a-grownup activities. Dye noodles. Easier than it sounds and not nearly as messy as you’d think. Record a story. Use your phone, tablet, computer, an old-school tape recorder, or a digital voice recorder to record yourself reading. Give your kiddo a bell to ring when you turn the page. Once you’re done, put the tape or CD in a large ziploc with the book. If you’re staying digital, make a folder with the recording and a picture of the front cover of the book. If you want to get really fancy, make a video of the pages while you read! Make a music playlist. Head over to Spotify or iTunes (we’re not Apple people) and make a playlist of your kiddos favorite songs. Make a personal dictionary. Add words that your kiddo uses frequently with sketches or printed pictures for reference. This can go with their writing supplies for future use and can be added to whenever they have a new favorite word. Make a costume. Here is the tutorial that goes with the picture on the card. Make music together. Get out those instruments, sing favorite songs, sing along with the radio! Music is good for you (and especially for your developing kiddos)! Play 20 questions. 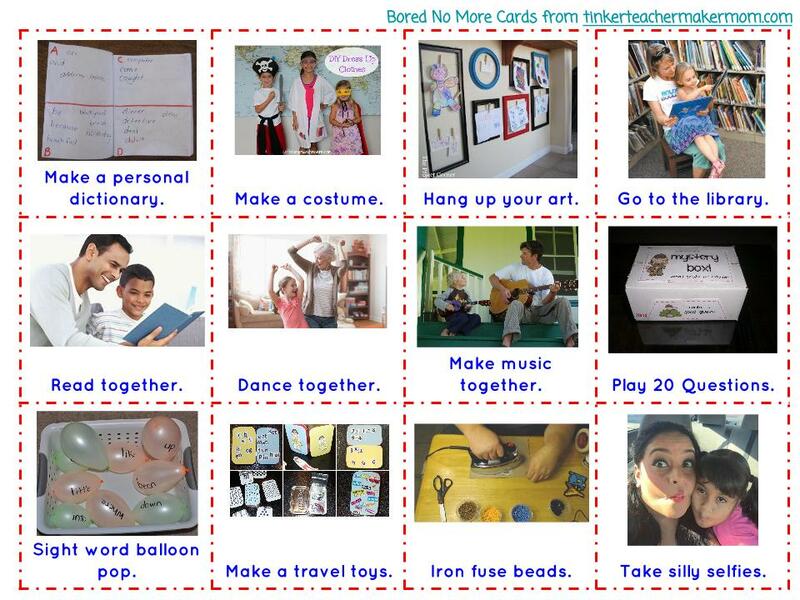 The printable for this mystery box is on TeachersPayTeachers. Sight word balloon pop. Remember when I said my tiny human pulls the “but I can’t REEEAAAADDD!” card? Yeah, not when reading means he gets to make loud noises! 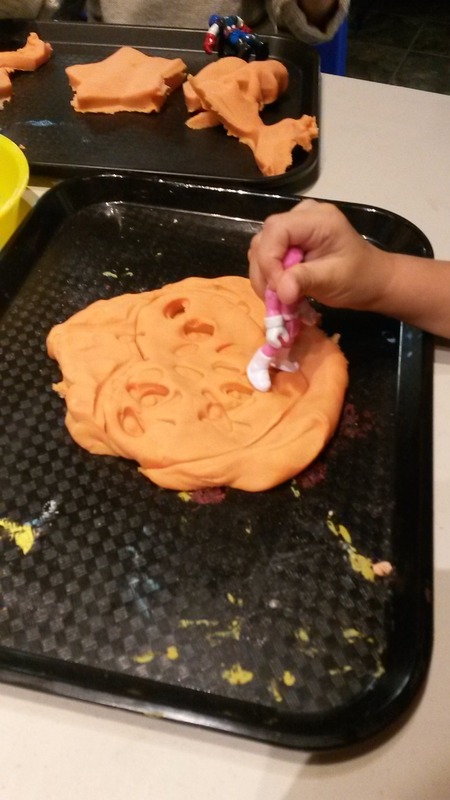 Make travel toys. We’ve done a Tic-Tac-Toe To Go and a Lego Tiny Tin is up next. Iron fuse beads. Remember those fuse bead projects from #19? Gotta have a grownup to do the ironing! Make puppets. There are options beyond socks and tutorials to tell you how! Play a board game. The benefits of board games may surprise you. Play hide-and-seek. Hide-and-seek has some important benefits, too. Make rock candy. This is happening at our house on Wednesday. Make grippy socks. After visiting the local trampoline place and having to buy their $2 per pair grippy socks, we decided to make our own. This project is also on the agenda for Wednesday. Have a silly photo shoot. Make an I Spy bottle. Here is one of many tutorials for this project that can later be made into an independent activity. Play outside. Games like Freeze, Red Light Green Light, Mother May I, Simon Says, and What Time is It Mr. Fox? help children learn about impulse control, an important executive function. 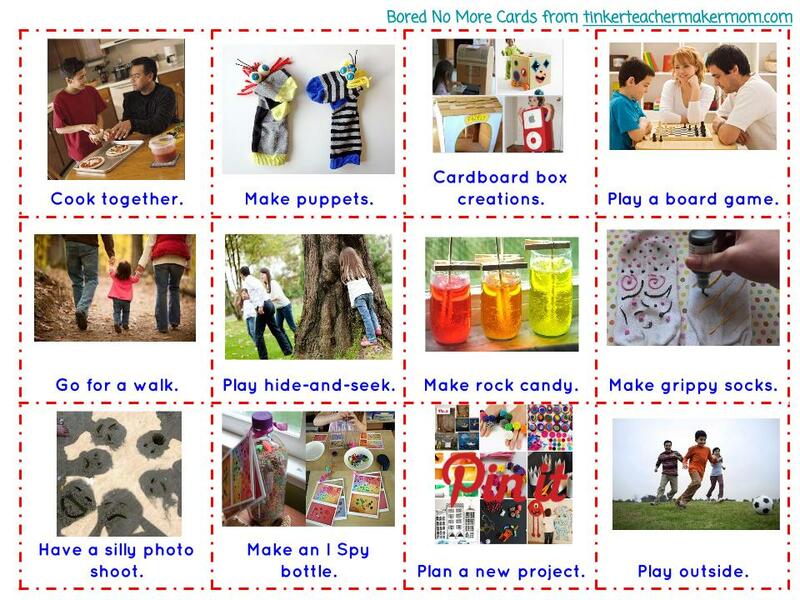 Here are more fun games to play. Make your own cards! 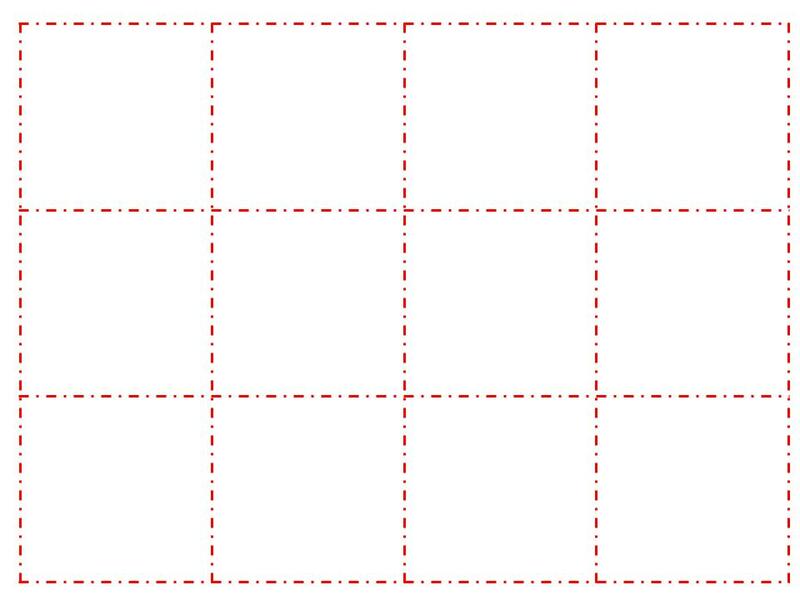 A blank is included in both the PDF and PowerPoint versions linked below. 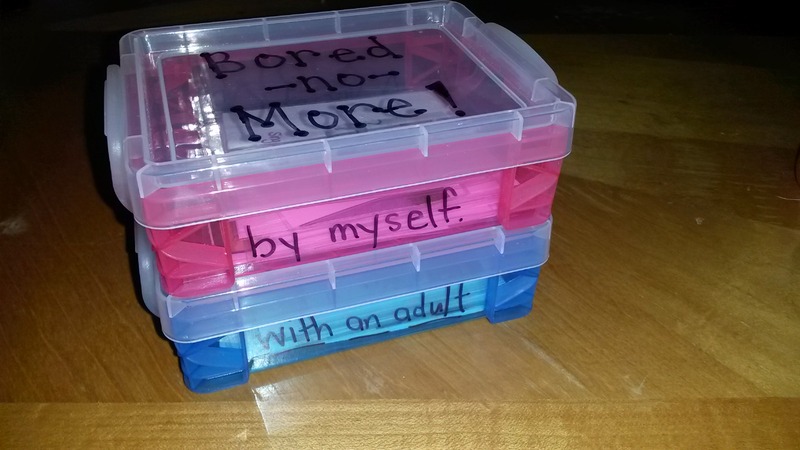 Enjoy and be Bored No More! Download all of the cards in PDF form here. 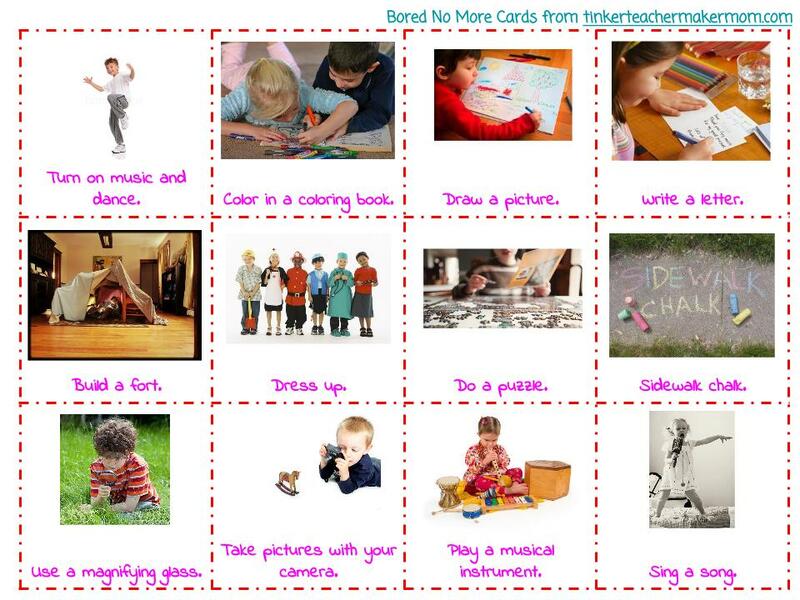 Bored No More Cards.pdf. To edit your cards, you can find a PowerPoint version Bored No More.pptx.